Recently, we returned from the most incredible trip through the Galápagos Islands. Before our cruise though, we considered many different itineraries whilst on the hunt to find the ‘best’ Galápagos Islands to visit. Which islands were must-sees? Was a cruise really the best way to get around? Hand-on-heart, we believe a cruise is absolutely the best way to see the archipelago but regardless of whether you’re cruising or island-hopping on a budget, join us as we share what makes each of the islands we visited tick. Located 1,000km off of Ecuador’s coast, this volcanic archipelago hosts a diverse and unique collection of both plant and animal species. Famous for inspiring Charles Darwin’s Theory of Evolution, the ideas that he introduced (and the animals that he studied), are clearly seen throughout the islands. The Galápagos Islands are widely considered amongst the best locations in the world to view wildlife in their natural habitat (if not the best). Don’t ask me why, but it’s as if the local animals missed the memo – they’re really fearless when it comes to human visitors, making observations (and potential interactions) all the more interesting. Beyond the ecological benefits of the Galápagos though, there’s a real sense of magic that just can’t be pinned down and certainly can’t be put effectively into words – though we promise, we’ll do our best! 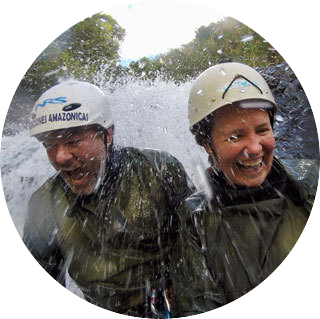 We intentionally chose to join Ecoventura on their Itinerary B – Western/ Northern Route. They promised to take us off the standard day-trip route and out into parts of the region that many people miss out on seeing. We can now say unequivocally that this was the right choice. With 13 main islands (and a further 7 smaller ones) though, the million dollar question must be asked; which are the best Galápagos Islands to visit? If you’re looking to plan your Galápagos itinerary, we suggest you use the following guide to decide which islands you’d like to pay a visit to. Or even better, book yourself a spot onboard the MV Origin and see the best of the islands, the way they’re meant to be seen. Geography: Area of 558km2, maximum altitude of 730m. San Cristobal is the most fertile island within the Galápagos and home to the oldest permanent settlement, found where Darwin first went ashore in 1835. Its one source of fresh water, a small lake called El Junco, was the main reason it was initially settled. Flora and Fauna Highlights: Sea lions playing on the shore and marine iguana sunning themselves, all right in the middle of town! Up in the highlands, you’ll also find the Centro de Crianza Jacinto Gordillo, an opportunity to see a Galápagos tortoise breeding programme in action. San Cristobal is the point of departure for many cruises and also serves a large number of day trip visitors. Though it wasn’t exactly what we imagined when we thought about the Galápagos, it had a lovely charm about it and worked well as a base. Geography: Area of 12km2, maximum altitude of 64m. The island is a volcanic caldera; this formation has created Great Darwin Bay which is surrounded by cliffs. Flora and Fauna Highlights: Known for its dense population of seabirds, Genovesa is a bird-watchers paradise. There you’ll find boobies galore (both the Nazca and red-footed boobies on mass), along with frigatebirds, the red-billed tropic bird and lava gulls. Keep your eyes peeled as you may even spot the evasive Galápagos short-eared owl – the only owl that you’ll find hunting on the islands during the day. Take to the water and you’ll spot a surprising array of tropical fish along with the stunning Sally Lightfoot crab, reef sharks and of course, playful sea lions. Population: The most populated island with 12,000+ residents. Geography: The second largest island in the Galápagos; area of 986km2, maximum altitude of 864m. Home to the largest port, Puerto Ayora, the island also supports the greatest variety of tourism-related businesses (hotels, restaurants etc. ); don’t be fooled into believing that Santa Cruz is ruled by people though. On the right trip, there are still plenty of opportunities to discover parts of the island that are practically untouched by humans. Flora and Fauna Highlights: The island of Santa Cruz offers a great deal of diversity thanks to its relatively large size. The highlands are home to lush foliage and an incredibly large population of wild giant tortoises (the islands are one of only two places in the world that they can be seen, the other being the Seychelles) whilst nearer the shore, flowering cacti, marine iguanas and land iguanas can be found. Geography: Area of 4,640km2, maximum altitude of 1,707m. The largest island in the archipelago, it is almost four times bigger than Santa Cruz, the second largest. Flora and Fauna Highlights: Isabela is home to a massive population of sea turtles and though there’s plenty else to be seen, the turtles really are impressive beyond compare! Though we thought we’d swam with a reasonable number of these beauties in the past, we soon found it didn’t even come close to our experience on the north-western coast of Isabela. In the water, we also found a number of mola mola (known as the sunfish) and the little endemic penguin. Only in the Galápagos will you find penguins in the company of more tropical creatures – absolutely incredible! Also on the island, visitors will find sea lions and marine iguanas sunning themselves high on the rocks, giant tortoises and land iguanas, finches and mockingbirds and the quirky flightless cormorant with their incredible, piercing blue eyes. Geography: Area of 642km2, maximum altitude of 1,476m. The third largest island in the Galápagos is also the youngest. Formed by the Galápagos hotspot , this volcanic island is still active and has been erupting since 2009. Unsurprisingly, this volcanic island is rugged and inhospitable, but surprisingly enough, life still thrives there. Flora and Fauna: The volcanic shores of Fernandina are a favourite amongst the local marine iguanas. Hundreds, if not thousands of these interesting lizards litter the ground – to the point that I very almost walked on one when I wasn’t paying attention! If you have the opportunity to snorkel off Fernandina, take it with both hands. You’ll be rewarded with countless encounters with feeding marine iguanas and marble rays bigger than you’ll see anywhere else. In addition, young sea lions can be found playing in the shallow pools, honing their abilities through play – we sat for what felt like an age admiring their strength and agility – whilst the endemic hawks hunt amongst the volcanic rock and lava cactus. Geography: Area of 5km2, maximum altitude of 367m. Easily recognisable due to its dark red sand beach (due to the exceptionally high iron content of the island’s volcanic rock) and brackish lagoon, Rabida provides excellent views along its shoreline. Flora and Fauna: On a good day, greater flamingos can be seen in the lagoon (though we didn’t have any such luck personally)… on an even better day though, a friendly sea lion will swim with you for half an hour, playing and nibbling at your flippers (true story!) Without a doubt, our sea lion encounter was the most memorable of all our time in the Galápagos and I would say of all time. Even if you don’t take up every opportunity to snorkel, if you see an inquisitive sea lion, be prepared to dive on in! In addition, Rabida is home to a unique ecosystem. The combination of shallow, sheltered waters and a host of mangrove trees makes for the perfect natural nursery; protecting baby sharks, rays and turtles on mass. Guides turn the panga (zodiac) engines off to ensure the little ones aren’t scared away and together, you’ll float through the mangroves, spotting a vast array of marine animals. The Galápagos Islands are unlike anywhere else on earth. Never before have we experienced such an incredible variety of animals, plants and geological sites within such a small, accessible area. The only question is which islands you’ll choose to visit. By the way, the answer is all of them! Thank you to Ecoventura for welcoming us on the MV Origin. Though we’ve had many amazing travel experiences, our time in the Galápagos genuinely topped everything! As always, all thoughts are our own. This entry was posted in Ecuador, Galápagos Islands, South America. Bookmark the permalink. Wow!!! Great photos.Hope you had a great experience out there. Thanks so much Britannica – it really was incredible! Thanks so much – it certainly was a memorable experience!